When you’ve lost a significant amount of teeth, even simple, everyday activities like eating or speaking can become embarrassing and difficult. You’re surely eager to regain a complete smile that allows you to feel confident again, but having dentures and/or implants placed can require multiple appointments and a great deal of patience. If you’re searching for a fast replacement that still provides you with quality and durability, please turn to Dr. Peter Johnson. As a Board Certified Prosthodontist (only one of six in the San Diego area), he can offer you the skillful, hands-on approach you need to smile brightly again in an exceptional timeframe. 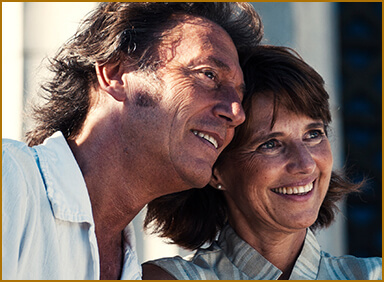 Unlike traditional dentures, immediate dentures are designed with a sped-up transitional process in mind. They do require some planning beforehand, though. Once Dr. Johnson has determined that you’re a viable candidate for dentures, precise measurements and original tooth placement will need to be noted so that we can ensure the new denture is as accurate and natural-looking as possible. He will also discuss with you any personalized changes you have in mind in order to create the ideal appearance. Once we have all of this important information at our disposal, our onsite lab will take care of your new denture’s creation with Dr. Johnson supervising every step of the way. On the day of your procedure, a Board Certified Oral Surgeon or Periodontist will extract remaining teeth and place implants as directed. Dr. Johnson will then fit your dentures to your mouth or attach them to implants as required. A final appointment at our La Mesa office will allow our team to make needed adjustments so that you can enjoy a sturdy and confident fit. Patients can find our Las Mesa, CA office conveniently located near the Sharp-Grossmont Medical Center and on the ground level floor in the first building of the Grossmont Medical Center. We’re proud to have served the San Diego community for over twenty years. Contact us today to schedule your first consultation with Dr. Peter F. Johnson.